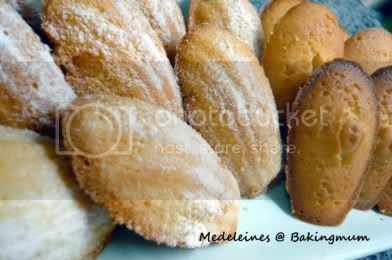 Another Madeleines recipe for you to try. The taste of this recipe is very good too. It is soft and moist and I like the buttery taste of it. 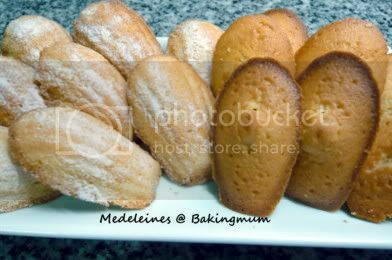 This is almost the same as the first Madeleines recipe I have posted before except for the milk and vanilla essence and lemon zest. The first time when I tried making Madeleines, I didn't have the proper moulds so I used mini tart mould. But this time round I have the Madeleines moulds so it is more authentic. Mix the sugar with lemon zest and set it aside for 1 hour for the smell to be infused into the sugar. Add the eggs into the sugar mixture and beat until mixture is slightly thick and add in milk and mix well. Add in sifted flour and mix well. Add in melted butter and mix until batter is glossy. Cover with a cling wrap and refrigerate for 1 hour. Oil the madeleines moulds with butter and lightly flour it. Tap away excess flour from the moulds. Fill the moulds with batter just slightly more than ½ full. 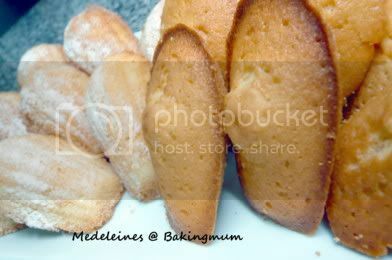 Preheat oven at 190C and bake the madeleines for 15 to 20 minutes or until brown. Unmould and leave on rack to cool. You can sift some icing sugar or snow powder on the madeleines when it has cool down completely. I want to bake 100 pcs of the baked donuts for a function, can I bake the donuts one day then decocrate the next day or must I re-bake the next day? Yes you can bake first and decorate it the next day. Use some melted chocolate to coat the donuts and then coat it with nuts or other decorations. You can set it at 5 or 6 for creaming butter and sugar. For eggwhite, start with 6 then when foamy and after adding sugar, turn it up to 7 or 8 to beat until peak. I don't usually go by timing. I use eye power to estimate if the creaming is enough. Hi where can I get zest of 1 lemon? Can I substitute with other ingredient?